Winter Park, Florida. — Daniel Frank Sedwick, LLC announced this week that their seventh Treasure Auction on April 7-9 realized $1.37 million (including buyer’s fees, same for all prices quoted here) and over 94% of the 2160 lots sold, well exceeding the pre-auction estimate. "Our latest auction proves that world coins and treasure items are still strong," said Daniel Sedwick, company principal and founder, "and that we achieve consistent results. This is our second auction in a row that reached over $1 million with a 94% sell-through rate, which is remarkable and a testament to the hard work we put in, both to get great consignments and to do what it takes to sell them all." Sedwick also pointed out that many sections like shipwreck coins were complete sell outs and brought record prices, particularly the Karl Goodpaster estate of 1715 Fleet silver coins. Gold cobs, as always, fetched strong prices, with the two featured Peruvian specimens from the Frank Sedwick estate realizing $19,550 (8 escudos 1712) and $18,400 (4 escudos 1711, finest known). Perhaps the most interesting coin in the sale was a Mexican cob 1 escudo from the 1715 Fleet that was flown to the moon aboard Apollo 14, and that coin brought $8,625. Most of the money, however, was in gold and silver ingots, including the highest priced lot in the whole auction, a naturally coral-encrusted "clump" of two complete gold bars from a mid-1500s Spanish wreck that brought $112,125. Many museum-quality artifacts sold for up to 5 times the high estimates. "People love bidding online, at their computer, in the comfort of their own home or office, even from their iPhone. At times we had more people actively bidding online than you see on the floor of a typical world-coins auction at a major coin show." A very strong online thrust via the Sedwick website as well as the bidding platform iCollector attracted over 25% new bidders from around the world. Also of benefit was lot viewing at the Baltimore show in March. Consignments pledged or already received for Sedwick’s Treasure Auction #8 in October (consignment deadline July 31) indicate that it will be another big event, with still more improvements and innovations in store. "Our goal is constant improvement through technological innovation, while retaining good old-fashioned personal service," says Sedwick, "and that formula is hard to beat." World’s only gold-bar clump, 2400 grams in two complete, long ingots, from the "Golden Fleece wreck" (ca. 1550). Complete gold "finger" bar #39 from the "Golden Fleece wreck" (ca. 1550), 1108 grams, 17K. Bronze astrolabe in exceptional condition, dated 1656, maker Agostinho de Goes Raposo. Gold "finger" bar #10 from the Atocha (1622), 687 grams, 23.5K. Ornate French gold boîte-en-baignoire (oblong snuff box) from the "Coconut Wreck" (ca. 1810). Large silver bar #604 from the Atocha (1622), 87 lb 2.3 oz troy, 2380/2400 fine, Class Factor 0.8. Lima, Peru, cob 8 escudos, 1712M, choice specimen from the 1715 Fleet, ex-Frank Sedwick collection. Lima, Peru, cob 4 escudos, 1711M, choice specimen from the 1715 Fleet, ex-Frank Sedwick collection, finest known. Cuzco, Peru, cob 2 escudos, 1698M, from the 1715 Fleet, choice, Plate Coin in Diving to a Flash of Gold by Meylach. Lima, Peru, cob 8 escudos, 1710H, 2 dates, from the 1715 Fleet, choice. Panama, cob 1 real, Philip II, no assayer, unusually fine style, unique. Small silver bar #820 from the Atocha (1622), 39 lb 10.08 oz troy, 2360/2400 fine, Class Factor 0.9. Lima, Peru, cob 8 escudos, 1708H, from the 1715 Fleet. Dutch bronze swivel cannon with "sea lion" handles and original yoke, ca. 1700. Neatly formed silver ingot from the Slot ter Hooge (1724), 1950 grams, w/stamps of the Zeeland chamber of the VOC. Mexico City, Mexico, cob 8 escudos, (171)0J, silver-cob shape, very rare, Plate Coin in the Pradeau reference. Mexico City, Mexico, cob 1 escudo, (1711-13), oXMJ, from the 1715 Fleet, flown to the moon aboard Apollo 14. Large and intact silver candlestick holder and heavy, round base from the Atocha (1622), marked w/crown stamp. Mexico City, Mexico, cob 8 escudos, oM-dot-J (1716-23), from the 1733 Fleet, rare. English brass-barreled flintlock blunderbuss rail gun with brass yoke and furniture. Lima, Peru, cob 2 reales, "Star of Lima" type, 165(9)V, rare, non-salvage. Santo Domingo, Dominican Republic, copper 2 maravedis, Philip II, assayer X, unique. Lima, Peru, cob 8 escudos, 1750R, from the Luz (1752). Large, natural, dark-green emerald from the Atocha (1622), 10.52 carats. Art McKee’s personal brass dive knife, signed and dated 1937 and with a cob soldered on the handle. Mexico City, Mexico, cob 8 reales, 1715J, full date, from the 1715 Fleet. Large "tumbaga" silver disc #M-96 from the "Tumbaga wreck" (ca. 1528), 18.03 lb. 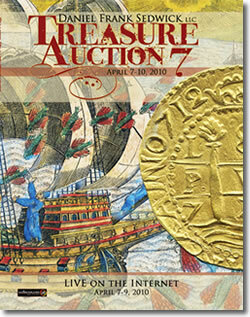 Prices realized for all lots sold in Treasure Auction #7 are available online at http://www.sedwickcoins.com/treasureauction7/pricest7.pdf. Inherited brass sheath steel blade ebony handle diving knife used with the old diving suits. How can I found out how much it is worth? Am looking to sell. Thank you for any assistance you may offer.